Summer is right around the corner and kids these days seem to have a problem with finding things to do. I remember when I was a kid my Mom would send me out in the morning and I had to be home before the streetlights came on that evening. Times have changed but there are still plenty of outdoor kids activities using things found in nature to keep your kids happy all summer long! Building a Dam – I found this to be a blast when I was a child. All it takes is sticks and stones and a puddle and your kids can make their own Dam. In spring there are plenty of puddles and small streams around the house but if you live in a hot dry climate you may have to make your own using a little water. This is also a great activity to make in the sand! If you happen to have some Popcycle sticks hanging around they work really well for building in sand or mud. Hopscotch – You don’t have to have a sidewalk and chalk to play this fun game. Your child can use sticks or rocks to make the squares of the game. Acorns or pebbles work fantastic for tossing onto the squares. Such a fun game and great for kids of all ages. Gymnastic Star – A favorite outdoor kids activity is balancing. Kids can balance on anything and I don’t know about you but I see kids everywhere doing it all the time! Especially when you are trying to hurry into a store and they see curb blocks in the parking lot (those concrete slabs at the front of parking spaces). There are plenty of things to balance on in the great outdoors! Your child can use curbs, logs, sticks and so much more. While you’re at it invite a few friends over and have a fun gymnastic competition to help get some of that energy out of your little one. Build a Fairy House – Building a fairy house is a fun STEAM outdoor kids activity to get your child’s mind moving! There are so many things in nature that can be used. I have seen whole tables settings made using small pieces of wood and sticks. Red and orange flowers are perfect for looking like flames coming out of a small campfire. If your child isn’t really into fairies feel free to call it Mickey Mouse’s clubhouse or anything that you child loves at the moment! Drawing in Sand or Mud – Sand or mud is a great place to get creative. This is one of those outdoor kids activities that may get a little messy! Your child can get creative using a stick and a little mud or sand. Bonus points are awarded if they are small and practice writing their words! Digging for Worms and Bugs – If the ground is a little wet it’s the perfect time to dig for worms. If you don’t have a kids shovel laying around a stick will do the trick! Show them how you can use the stick to dig in the ground and find worms. We always try to teach them not to harm them but there is no harm in just checking them out. Having problems finding some?? Try flipping a log or even a stepping stone in your yard. You will find plenty of creepy, crawly goodness in the darkness below. Try having a magnifying glass on hand for a better look! Build a Birdhouse – This is one of my favorite outdoor kid’s activities but I must warn you, it can get a little messy. Your child can mix up a little mud to use for mortar (just mix dirt and water) and can create a fantastic birdhouse using small sticks around the yard! The thicker the mud the better for this activity. Set your child’s creation in the sun to dry and display in the garden. 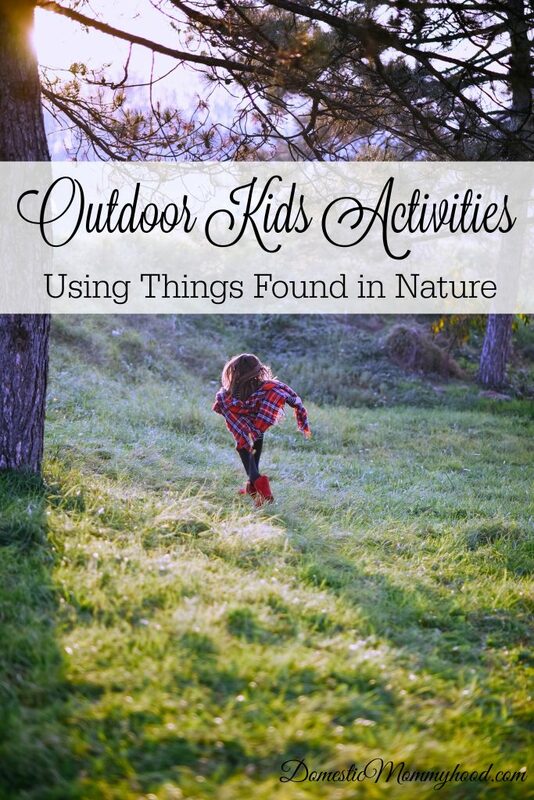 Outdoor kids activities using things in nature is a great way to get your kid’s creative juices flowing! If your child has a hard time coming up with ideas on their own you may want to try making an “idea jar” to help them along. Summer is near and no parent wants to hear the “I’m bored!” line all summer long. What is your child’s favorite outdoor Kids activity?